Elite receivers have always represented the utmost commitment to the artist’s original vision. Combining audio and video processing technologies found nowhere else in their class with multiple professional-level control options, all Elite receivers possess the capability to elevate your entertainment experience beyond what you’ve ever expected. And with an eye towards total home theater integration thanks to connectivity with analog, digital, and network sources in addition to maximum audio and video precision, these receivers are your solution for a completely unrivaled home entertainment control center. The “Made for iPhone®” certified Pioneer Elite Receivers effortlessly incorporates your Apple® products into your home theater. And with Pioneer’s exclusive iControlAV app (downloaded separately via the Apple App Store) your iPhone or iPod touch® is transformed into a full-function remote control. Pioneer Elite Receivers offers connectivity options for all your latest high-definition home theater components, plus support for up to three zones. DLNA 1.5 support means you can stream your network-connected content to your home theater, and RS-232 support means compatibility with the latest professional home automation systems from Crestron® and Control4®. Furthermore, Pioneer Elite Receivers features an ICEpower® Class D amplifier for unparalleled response accuracy, housed within an audiophile-grade separate component chassis. Pioneer Elite Receivers brings extensive connectivity for your digital media via Ethernet and a front HDMI® input, and compatibility with Bluetooth sources (using the optional AS-BT100 adapter, sold separately). Get a truly plug-and-play iPhone experience with your home theater. Thanks to the Pioneer Elite Receivers “Made for iPhone” certification, you can enjoy music with iTunes® album art, movies, downloaded TV shows from iTunes, photos, and more. An included USB/composite video cable makes connecting your iPhone to share your favorite media easy–and your iPhone charges automatically when connected. This included cable also works with most generations of iPod Classic, Nano, and iPod touch. Share your videos, and enjoy music with full album information and album art on your TV. Your iPhone device’s wireless and network features remain fully functional and music and movies will mute when you receive an incoming call. And you’ve got lots of control options–use the iPhone directly, or push a single button on a Pioneer Elite Receivers front panel to switch control to the included preset remote and an intuitive, full-color GUI. Plus, your iPhone device’s music will always sound its best thanks to Pioneer’s exclusive Advanced Sound Retriever technology, which restores lost data in compressed music files. So even in a big room, you’ll get much closer to the artist’s original intent from you iPhone, iPod or other MP3 player. And Auto Level Control means a smooth, consistent listening experience with no jarring volume changes between your favorite songs and albums. Pioneer’s Free iPhone App Turns Your iPhone or iPod touch into a Powerful Control CenterPioneer’s iControlAV (free download from Apple’s App Store) gives you total control over your home theater sound. With controls for master and per-zone volume, sound fields, and more, you’ve got a simple but powerful way to adjust your home theater sound any way you like. The iPhone and iPod touch’s accelerometer are used to control balance, bass and dialogue–no confusing sequence of remote buttons to remember, just tilt and maneuver your Apple portable device until the sound is right where you want it. In addition to connections for all your home theater components, a front HDMI input lets you conveniently connect high-definition devices like an HD camcorder to view your videos in all their glory in your home theater. A front USB port lets you connect your digital camera or portable media player to display a slideshow of JPEG photos on your HDTV, or play MP3, WAV, or WMA music files with full ID3 tag and album art support. Elite receivers will display up to 32 album art thumbnails on your TV, and you can scroll through them with the included remote. And your options don’t stop with your portable devices. When connected to your home network, Pioneer Elite Receivers are your portal for thousands of Internet radio stations — all just a few clicks of the remote away. Home Media Gallery allows you to stream your network-connected content with DLNA 1.5 support. Enjoy Rhapsody® or Sirius® Radio, stream MP3s and photos from your PC or a network-attached hard drive, and more–and you can even send it to a second zone. There are more ways to control your Pioneer Elite Receivers than just your iPhone. There’s a full-color on-screen GUI for use with the included preset learning LCD RF remote, so you can make guided adjustments to your home theater sound. Not only that, but the SC-37 lets you connect a USB keyboard so you can rename stations for radio and Internet radio, network settings, and more. For further control, the SC-37 includes PC control software, so you can control your home theater right from your PC or laptop. For wireless connectivity, add a Pioneer AS-BT100 Bluetooth adapter (sold separately) to release your music from your iPhone, iPad®, Blackberry®, or Android® smartphone as well as other Bluetooth-enabled sources like laptops. And Pioneer Elite Receivers Advanced Sound Retriever AIR technology restores critical audio data that is often removed from compressed audio formats, especially when transferred via Bluetooth. All of Pioneer’s latest receivers support the latest HDMI 1.4a specification, meaning that you’re not just getting the most out of your existing movies and music, you’re preparing for the next generation of 3-D video content with the Pioneer Elite Receivers. And with multiple HDMI inputs, including 1 on the front panel, plus 2 HDMI outputs, you’ve got more than enough connectivity options for the growing number of high-definition sources available today. And newer Pioneer Elite Receivers support for HDMI 1.4a’s Audio Return Channel (ARC) means fewer cables needed for connecting to your home theater. Pioneer has long been the leader in video processing and combining. Pioneer Elite Receivers benefits even further with Marvell’s advanced Qdeo video processing, which lets you upscale your picture to digital 1080p/24fps from virtually any source, including analog. 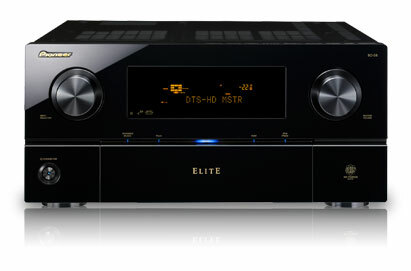 Pioneer Elite Receivers has also benefited from Pioneer’s collaboration with the famous AIR Studios in London, where it was evaluated and modified at a prototype level to meet the very strict standards set forth by studio engineers. The trained ears at AIR Studios know first-hand what goes into an artist’s craft and their objective is perfectly in-line with that of Pioneer: to accurately reproduce in the home theater what the artist originally created in the studio. Of course all the latest Pioneer receivers support high-definition audio formats like Dolby® TrueHD and DTS-HD® Master Audio to give your Blu-ray Disc® movies a soundtrack that’s true-to-life. But Pioneer Elite Receivers add an extra dimension with support for Dolby Pro Logic IIz and THX Ultra 2 Plus certification for the ultimate immersive experience. Pioneer’s exclusive Multi-Channel Acoustic Calibration system (MCACC) provides a near studio-quality, multi-channel listening experience that customizes each of the Pioneer Elite Receivers 7.1 sound channels specifically to your listening environment. Additionally, the Auto Level Control feature can equalize volume level differences between tracks playing from a portable audio device or commercials during television programming so the volume can be enjoyed at a consistent level–no more jarring “blare” when switching audio sources. All of these technologies come together in the Pioneer Elite Receivers to deliver an unprecedented level of control and sophistication for the serious home entertainment enthusiast.